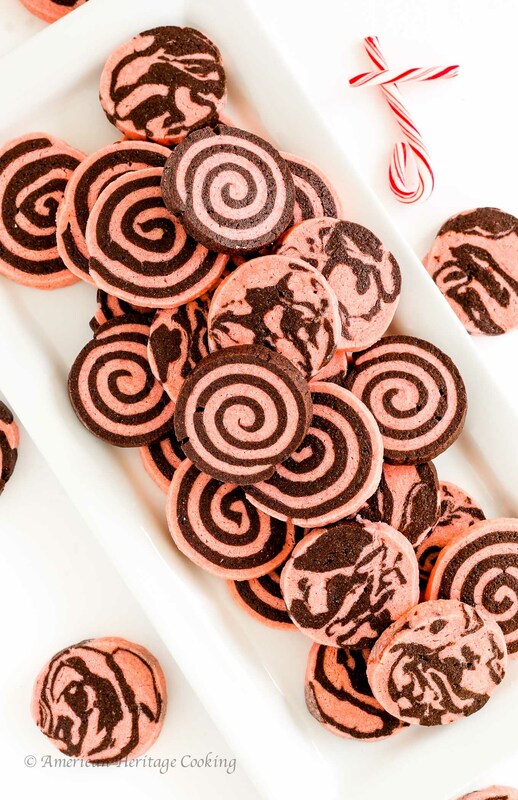 Chocolate Peppermint Sugar Cookies are the marriage of my two favorite holiday flavors: chocolate and peppermint. Two easy sugar cookie doughs are swirled together to create a delicate, tender and show-stopping Christmas cookie! And we’re back with my annual 12 Days of Christmas Cookies! Woohoo! 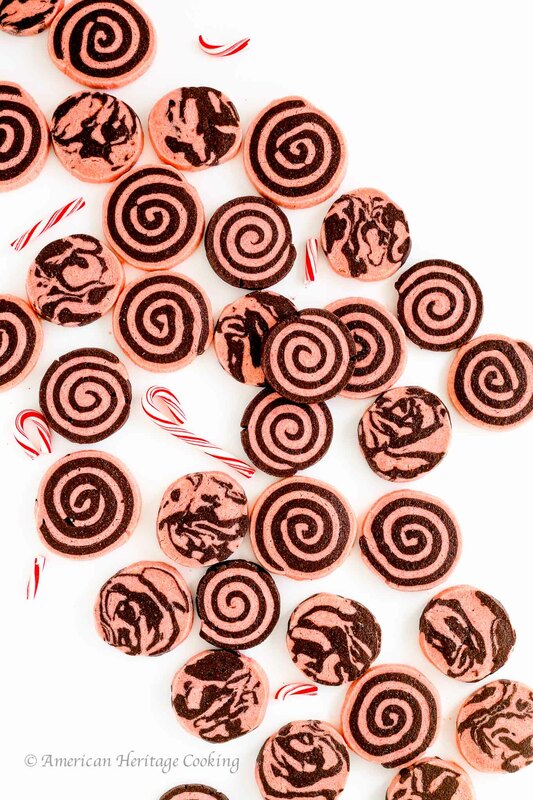 Love it or hate it, peppermint is inextricably linked to Christmas and December. I’m not a lover of the peppermint. You will never find me noshing on a candy cane or one of those ubiquitous peppermint candies that grandmas and doctors ALWAYS have on hand. Peppermint ice cream? No thanks. Peppermint white chocolate frosting? Pass. But the second peppermint is combined with dark chocolate, I lose all self-control. Peppermint mocha? Thank you, Starbucks, you are a blessing. Peppermint hot chocolate? Be liberal with the extract will you, please? Peppermint chocolate bark? Is that even a question? So it seemed natural to swirl my two favorite Christmas flavors together into one happy little sugar cookie! You will love the delicate texture of these cookies – they are like a soft, almost chewy shortbread that melts in your mouth. 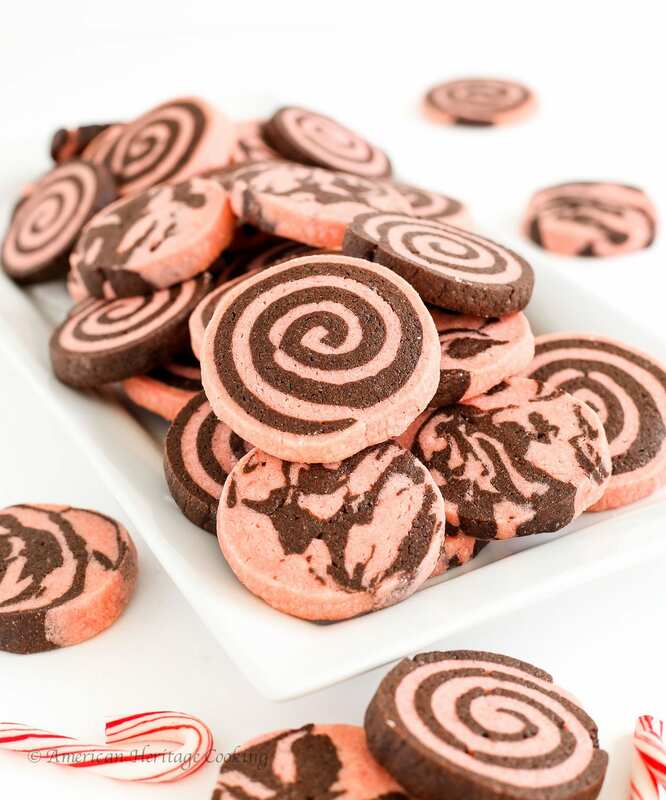 I swirled together a chocolate dough with a colored peppermint dough and then made the marble cookies with the scraps. 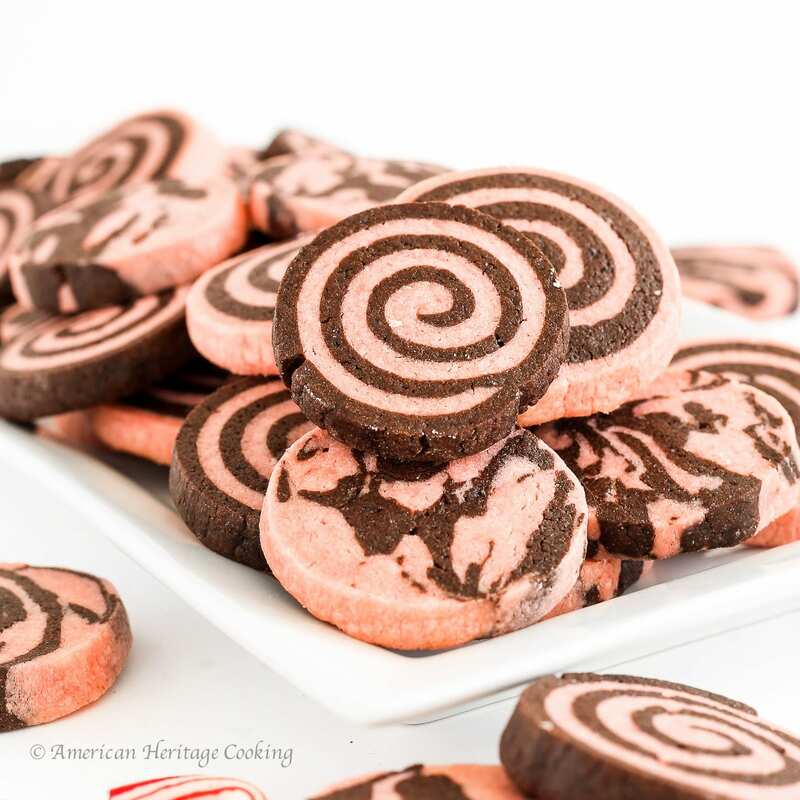 You could skip the rolling altogether and just make marbled cookies! P.S. Before you go calling me a liar…I decorate my tree with those mini candy canes in the photos! Because adorable is my weakness. Stay tuned for the next 11 Days of Christmas Cookies, and if you need more cookies to tide you over, don’t miss the 12 Days of Christmas Cookies 2015 or the 12 Days of Christmas Cookies 2014!!! In the bowl of a stand mixer cream the butter and sugar until light and fluffy. Add the egg and beat to combine. Add the flour on low speed alternately with a little milk, beginning and ending with flour just until the dough comes together. Divide into two equal portions, flatten slightly, wrap in plastic wrap and chill while you make the peppermint dough. At this point the dough can be refrigerated for up to 4 days or frozen for 2 months. Cream butter and sugar until light and fluffy. Add the egg yolk and beat to combine. Add the peppermint extract and food coloring. Reduce mixer speed to low and begin adding the flour one large spoonful at a time. Add the next scoop when the first is almost incorporated. Mix only until combined. Divide into two equal portions, flatten slightly, wrap in plastic wrap and chill while you roll out the chocolate dough. At this point the dough can be refrigerated for up to 4 days or frozen for 2 months. Roll out each portion of the chocolate dough into a rectangle on a lightly floured surface until it is 1/8th inch thick. Transfer to a parchment lined baking sheet and chill 1 hour or overnight. Roll out each portion of the peppermint dough into a rectangle on a lightly floured surface until it is 1/8th inch thick. Transfer to a parchment lined baking sheet and chill 1 hour or overnight. To make a swirl: Trim the dough into two rectangles of similar size. Save the scraps. Temper the dough for about 10 minutes at room temperature or until it is flexible. Orient the chocolate dough so the long side is closest to you and the edge of the counter. Place the peppermint on top of the chocolate (the bottom/outside dough should still be on the parchment) but leave about 1/8th inch overhang of the chocolate. In other words you should see 1/8th inch of the chocolate dough peeking out from under the peppermint. 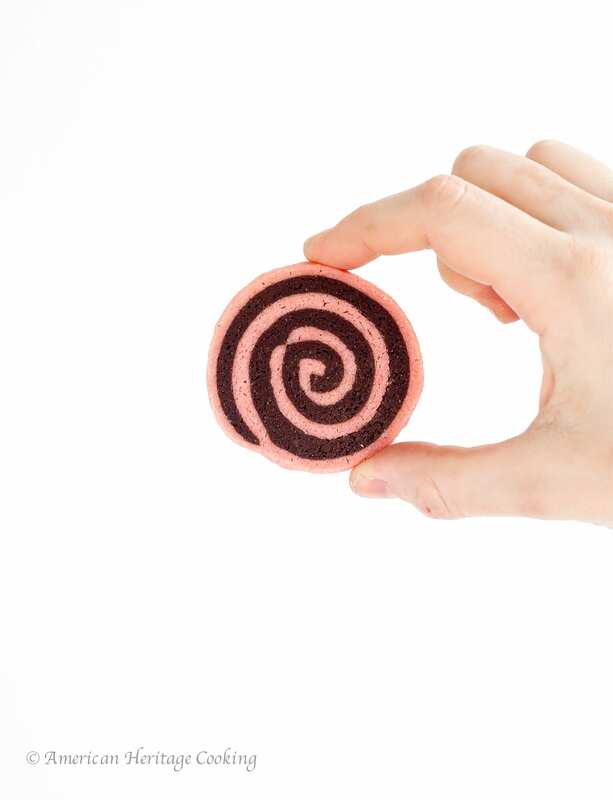 Begin to roll the chocolate over the peppermint – rolling away from you. Once you start the roll, use the parchment to guide the dough. This will limit the cracks in the exterior. Once you roll all the way up, close the roll and refrigerate. Repeat with the remaining two rectangles. Refrigerate overnight. To make a Marble: Combine all the scraps from the swirls and roll into a log in parchment. Refrigerate overnight. Slice the logs into ¼ inch slices and place 1 inch apart on parchment lined baking sheets. Bake in preheated oven 5-7 minutes or until the edges begin to brown and the centers are matte. You can use more red food coloring to achieve a redder dough rather than the pinkish-red that I had, but you will eventually taste the food coloring. Yum! I will try these!! I hope you do, Josephine! Merry Christmas and Happy Cookie Baking Season!!! You are most welcome Jo-Anne! I hope you make them too! And you have the earthenware crock! I bet her cookies were fantastic! Happy baking! these cookies are SO pretty, and just begging to be on a holiday cookie tray!! !